Being disabled or being injured in an accident doesn't mean that you have to lose all of your freedom. There are things that can be done to help make your daily life easier. 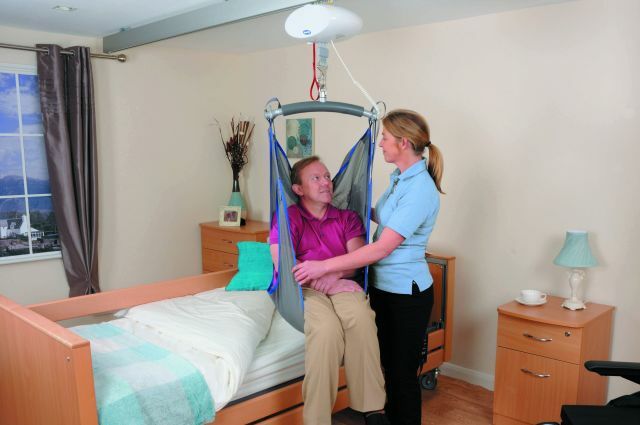 When people need help moving from one position to another, whether it is in their home, in hospital, or in a care home, choosing the appropriate equipment, such as ceiling track hoists or mobile hoists can make all the difference. Manual lifting and handling of a patient can place a lot of strain on the person trying to help, whether or not they are a professional or a family or friend. Sometimes repeated lifting can cause the carer to suffer from minor injuries or back pain, so a ceiling track hoist is a great way to minimise the lifting required for the patient.. The main aim of using a ceiling track hoist is of course to reduce the risk of injury to both the disabled person and the carer to the lowest level. In the process of doing so, everyone's lives can be improved, because they can be sure that they won't be injured in the process of lifting, and the patient will have more freedom to move around their home. So it's not just the quality of life for the disabled person that is improved with the installation of a ceiling track hoist, it can also be incredibly beneficial for the carer of that person too. In short, the quality of life for everyone involved can be greatly improved with the installation of a ceiling track hoist. When choosing a ceiling track hoist, it's really important to make sure that the equipment you use is suitable for the task in hand. Before the installation, it may be necessary to carry out a thorough assessment of the property and to ensure the ceiling hoist you choose is appropriate for the use required. It's common for people to be unfamiliar with their new ceiling hoist when it is initially fitted, but with good training and plenty of practice, it will become easier to use and the whole process will become much quicker over time. For help and advice about having a ceiling track hoist fitted in your home, ACS Healthcare can help. Our range of ceiling track hoists and mobile hoists for the disabled really can change lives. Call us on 0114 288 9912 for more information today.